"This fascinating pork-on-a-stick recipe is American cuisine in a nutshell. City cooks, who couldn't get chicken, would take scraps from much cheaper, at the time, pork and build something similar to what you see here. Why this represents the true spirit of American food is that long after chicken became cheap and plentiful, people kept making and eating this anyway. Serve with honey mustard." Cut tenderloin into three sections; the thick center section and two end sections. Cut the thinner end portion of the tenderloin into chunks. Slice the thick center section lengthwise into even halves. Cut the 2 center sections and thicker end portion into1/2-inch slices. Thread pork pieces, starting with the smallest pieces and working up to wider pieces, onto each skewer to resemble chicken drumsticks. Season skewered 'drumsticks' with salt, black pepper, thyme, and cayenne pepper on all sides. Whisk eggs together in a bowl. Pour flour into another bowl. Put the bread crumbs into a third bowl. Gently press the 'drumsticks' into flour to coat and shake to remove excess flour. 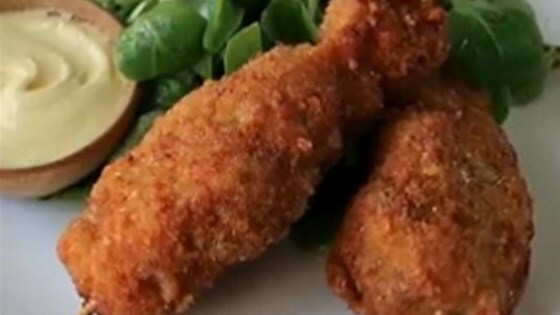 Dip 'drumsticks' into egg and press into bread crumbs. Place finished drumsticks on a plate in a single layer and refrigerate, uncovered, for 15 minutes. Heat oil in a cast-iron skillet over medium-high heat until the surface of the oil is shimmering. Cook 'drumsticks' in the hot oil until golden brown on all sides and cooked through, 4 to 5 minutes per side. Transfer to a paper-towel lined plate; let rest 5 minutes. Season with salt. See what happens when a small town drumstick goes to the big city. Absolutely fabulous!! My Mom has made this recipe "forever" and are entire family and friends just love it. Thanks Chef John for sharing!